The biggest complaint from anyone just starting out in photography is the shock when they realize how much money all this equipment is. The struggle is real people, and this adds up very fast. If you are just starting out, buying used gear can be a great option for you. 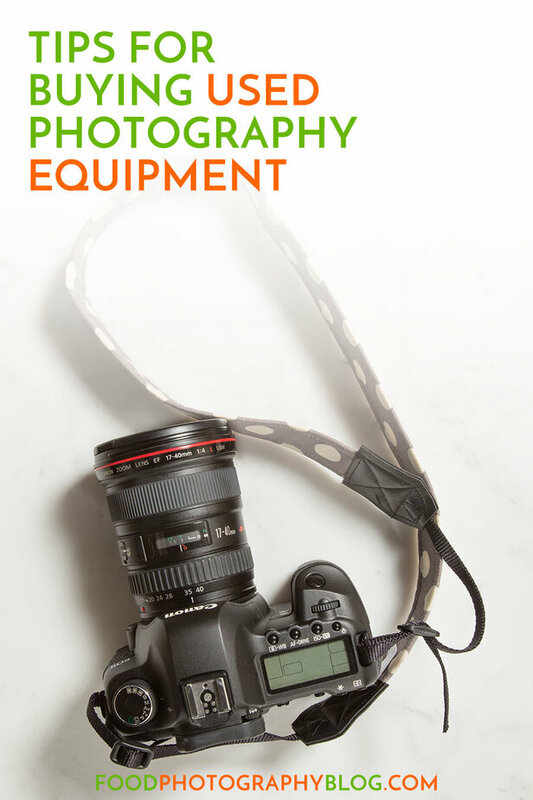 If you are trying to decide if you want to take your photography hobby and turn it into your career, buying used gear can save you some money while you decide. If you are a pro shooter, you will be buying a lot of gear and buying used gear is always a great option – IF you do your research and buy from the right places. I buy used gear all the time so I’m going to share with you how I go about getting my used equipment. I’ve learned the hard way, so hopefully you don’t have to. I’ve been buying used equipment since I was 16. I’m 50 years old this year. So trust me when I say I learned the hard way. But with a little bit of research on your part, you can save a lot of money and get great equipment. The first section is about Ebay, then I will address other ways of buying used gear, not using Ebay. One way to get great equipment for a lower price tag is to buy it used from a reputable place. I do use Ebay a lot for gear. I’ve used ebay since it first started. These days, there are many reputable ebay sellers of used photo equipment. 99% of the time, I buy used equipment from a large ebay photo store. I’ll tell you about when I buy from an individual later. I like Ebay because they really protect the buyers through Paypal. So if you get gear that was not in the condition they said, ebay and PayPal will support you with returning it and getting a full refund. I’ve only returned three items in all my years. I have over 100 transactions on ebay. One was a Phase One digital back and camera for $10,000 – the camera was dead on arrival so Ebay really helped me because of the price point. The other two returns were lenses that were not in the condition as promised. Here is what you have to look for when buying used gear from anyone on ebay. HOW MANY TRANSACTIONS AND POSITIVE FEEDBACK RATINGS? There are two things that are equally just as important when vetting an ebay seller. What is their Positive Feedback rating, and how many transactions have they done so far. So if a seller has had 26,173 transactions and their feedback is 99.8 – that’s a great seller, and they have a “Top Rated Seller” badge. If they have 1000’s of transactions – they will never have 100 %. They are always going to get some nutcases who will never be happy not matter what they do in life, so you have to account for that. 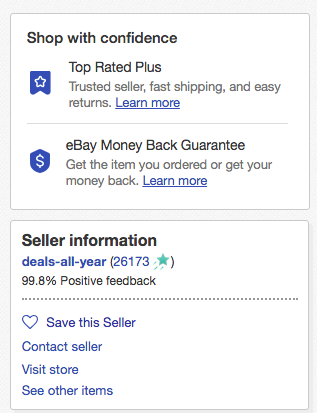 Now, if they are claiming they are an actual Ebay store, but only have a few hundred transactions and they don’t have a 100% rating – that’s a red flag to me. This seller pictured on the left would be a good seller to consider buying from. Also, check out their sales page (you click on their name to get to their seller’s page) and what other items they sell. Make sure they specialize in photography equipment, and this one lens or camera they are selling isn’t just a one off piece of photo gear. You need to make sure they know and understand what they are selling. 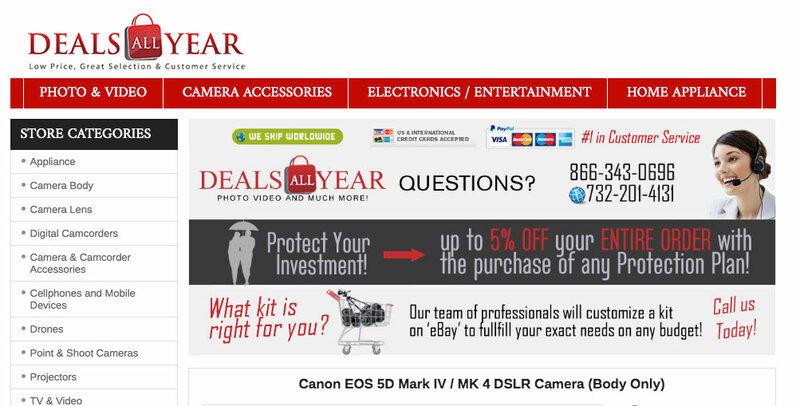 In this example, Deals All Year only sells photo and video gear, so again, I would feel safe buying from them. So they have to have a ton of transactions, and all photo related. For some reason, many of the low priced new equipment sellers are in New Jersey and Brooklyn. Seriously, I don’t know why, but that’s the way it is. What they will do is sell new equipment without the manufacturer’s warranty, but include their own warranty. The length of warranty varies per seller. What this means is that if anything goes wrong, the brand that made the gear won’t fix it, but the ebay seller will. I bought my Canon 5D Mark III this way, and it worked out fine. In my example here, Deals All Year are in New Jersey as well. Go figure. WHAT IS GRAY MARKET EQUIPMENT? This is the what Deals All Year says about the Canon 5D Mark IV I just looked up. This is a Gray Market camera. Under “Warranty” it says, “Import Model”. This is a gray market camera. Gray market is any equipment not made for the US market, and most likely will not come with any original manufacturer’s warranty. Some people won’t buy this gear, I’ve bought two cameras this way and it worked out fine. What I always do is make sure that the store offers their own warranty for at least 1 year. If they won’t do this, I won’t buy it. CAN YOU CONTACT THE STORE? I won’t buy from an Ebay store unless they have a phone number on their ebay item listing page, or their ebay store page. This is actually very important. In theory, they are allowed to post their item for sale without a phone number, but if it’s a legitimate business, why wouldn’t they want their phone number listed? I also call the number to make sure they actually answer it and then I ask them about their warranty. I ask them if the gear is gray, or black market gear. If they tell me on the phone it is, but it’s not saying that in the ad, I totally question them about that and say I’m not buying from them because they are not fully disclosing this in the item listing page. By the way, I’m writing this on a Sunday at 4:00pm. I called this store and THEY ANSWERED! I talked to someone right away and he answered all my questions. You can ask for the serial number of the item and call the manufacturer to check where this camera was made. The 5D Mark IV I was calling about was made for the Chinese market so that means it only has English and Chinese available for the languages with the camera interface. They said everything else was the same as the US market. ***This seller says in their terms that they have a 10% restocking fee. I’m unclear if that is for any type of return, meaning if there is something wrong, they will work with you to fix the problem or still charge that fee, I’m not sure and I didn’t ask when I called them. I do feel that they are still a reputable seller on ebay. So if you change your mind and there is nothing wrong with the camera, you will be charged the 10% fee, which I feel is only fair. Please know I haven’t used them before, I’m just using them as an example here for the post. Make sure you have a 30 day money back guarantee, whether it’s new, or used equipment. Read this carefully – some of them say they do the 30 day guarantee, but will charge you a 10% restocking fee – that’s huge and a big red flag. I tend to not buy equipment from an individual unless they have a lot of transactions, at least 200, and a 100% positive feedback. Read the feedback reviews on the sellers just to make sure they are all consistent with great reviews. Make sure the seller isn’t shipping from somewhere that is going to cost a lot of money for you, and double check the shipping rates. Buy in your own country! Ask about duty fees if buying out of your country. There’s a lot of ebay sellers from China that are selling knockoffs. They have lots of transactions but their feedback isn’t near 90 perfect positive. Be warned. Read the entire ebay listing – look to see if they say, “image shown may not be actual item up for auction”. This means that they are showing you a camera image from the manufacturer, but the actual camera they are selling you might have some scratches or scuffs on it. I avoid those. I want to see the image of exactly what I am getting when used – unless they claim it’s brand new – then it should be in pristine condition, and then, it’s ok for them to show the manufacturer’s photo. If you are buying a camera, depending on which model, you can ask for a “capture count”. This is how many times the shutter took a picture. You want the lowest capture count you can get. Unfortunately not all cameras keep count of this but it’s always worth asking. I always ask, how the gear was used. If it was studio equipment, that means it might not be as abused as travel gear. Seriously, I bought a Canon lens from an individual (not a store), and it had dried mud on it! You could barely turn the focusing ring to focus it. So I just took some snaps of the muddy lens with my camera phone and sent it back for a full refund. A store might not know the history of the gear, but many of them do and would be happy to tell you about it. Immediately upon getting the used gear you bought, test it right away! You cannot delay in this. If you wait 30 days to test the used camera you just bought and it won’t even turn on, you just lost all that money. Local Camera Swap Meets – Ok, so before the internets, this is how we bought our cameras. Here, you can chat with the seller and get all your questions answered. A lot of the time, they know the photographers who they bought the gear from, and can tell you more about how it was used. Your favorite local camera store. Many family camera stores sell used gear. This can be a great option and again, they will know how the gear was used a lot of the time. Adorma has a huge section of used equipment, and they’ve been around for a very long time. I’ve bought a lot of gear from them over the years, both used and new. B & H video – I’ve been buying used gear from B & H since the 80’s. They are not the friendliest of folks, but really know their stuff and have a ton of gear. Hunt’s Photo is in New England and has been around for a long time. This is a smaller family store with a lot of locations. I have not bought from them personally, but I know others who have and they recommend them. KEH Photo – I’ve bought a bunch of stuff from them too. Amazon also has people and stores selling used gear – be very careful of the reviews and only buy from very highly rated stores here – there’s a ton of Chinese and Korean knock offs on Amazon now, I’m sad to say. Do your research. My last piece of advice for buying equipment is to do your research. Here is a great website I always end up going to when looking up gear. Ken Rockwell’s Reviews. It is not pretty, seriously it looks like it’s from 1995, but the info is good and it’s very easy to find specs on any cameras or lenses you are considering. 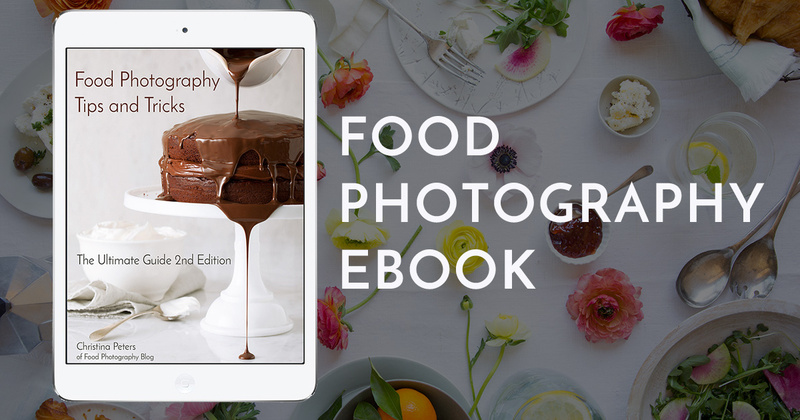 Once you have your used gear, check out my ebook on food photography to get some great tips on how to used your new equipment. I’m going to buy a telephoto lens for food photography instead of a macro one. I guess it’d be versatile for kinds of applications and I guess EF 80-200 L lens will be a good choice. What’s your opinion? My camera is canon EOS 60D. Hi Brad, ok so the crop factor on your camera is 1.6. This means that the 80-200 will act like a 128-320mm lens. If you need to shoot a dish from across the room, then this is the only time you would use that lens. That lens is for landscapes. Telephoto lenses are to bring far away things closer to you. You need a macro lens if you want to do close up work. The other thing with telephoto lenses is that you cannot get close to your set at all. Your minimum focus distance on that lens is 4.9 feet. That means the closest you can get to your set is 4.9 feet. That will make shooting food very difficult. Also those lenses are very dark. Meaning, you will have to shoot on a tripod because the long lens needs a lot more light to get to the sensor so you’ll be at much longer shutter speeds. In my opinion, the telephoto lens is not a good idea for food at all but great for landscapes. Quick question…on KEH they have different levels of “used” for equipment. Specifically regarding lenses, how low on the scale do you go? If they say the lens has spots or dust, but it “shouldn’t affect image quality for example – would you buy it or buy the EX or EX+? Hi Christa, Ah, I forgot to talk about that. I don’t buy the cheapest quality on KEY I try to get EX or EX+ for sure. I do not buy any lenses that say they have spots or dust. Honestly, they could be fine, but I just don’t like the idea that there is already dust in there. It happens and there’s nothing that can be done about it but it’s just the whole idea of that I don’t like.